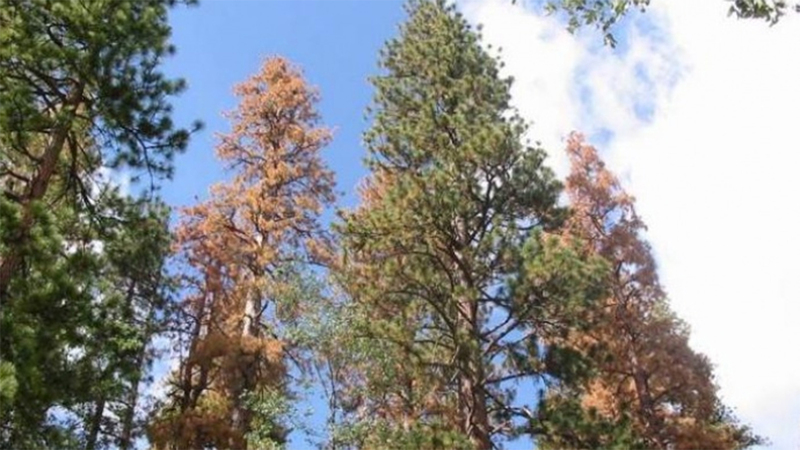 FRESNO, Calif. (KFSN) -- The U.S. Forest Service announced that an historic 129 million trees on 8.9 million acres have died due to drought and bark beetles in the state of California. The dead trees continue to pose a hazard, especially in the central and southern Sierra Nevada, they say. The U.S. Forest Service said even though there were record rains last winter, the effects of five consecutive years of severe drought, bark beetle infestation, and rising temperatures have contributed to the historic levels of trees dying. "The number of dead and dying trees has continued to rise, along with the risks to communities and firefighters if a wildfire breaks out in these areas," said Randy Moore, Regional Forester of the U.S. Forest Service, Pacific Southwest Region. "It is apparent from our survey flights this year that California's trees have not yet recovered from the drought, and remain vulnerable to beetle attacks and increased wildfire threat. The Forest Service will continue to focus on mitigating hazard trees and thinning overly dense forests so they are healthier and better able to survive stressors like this in the future." Moore continued, "To increase the pace and scale of this important work, we need to fix how fire suppression is funded. Last year fire management alone consumed 56 percent of the Forest Service's national budget. As fire suppression costs continue to grow as a percentage of the Forest Service's budget, funding is shrinking for non-fire programs that protect watersheds and restore forests, making them more resilient to wildfire and drought." So far, California's Tree Mortality Task Force (TMTF) has felled or removed over 860,000 dead trees. The TMTF is made up of more than 80 local, state and federal agencies and private utility companies. The forest service says they are using a triage approach to removing the dead trees by focusing their efforts on high hazard areas. The U.S. Forest Service and Cal Fire are also increasing the pace and scale of prescribed burns to reduce dense areas of dead trees. "Tree mortality at this magnitude takes on-going cooperation between public, non-profit and private entities," said Chief Ken Pimlott, CAL FIRE director, and California's state forester. "California's forests are a critical part of the State's strategy to address climate change. By working together and using all the resources at our disposal we will be able to make more progress towards our common goal of healthier, more resilient forests that benefit all Californians."